The classical finance theory treats all market participants as rational individuals making their decisions in order to maximise their personal financial benefits. However, practice has shown that there is a big number of cases where perceptions, emotions and the media influence the decision-making process, pointing out that investors often behave unpredictably, sometimes even irrationally. Although humans are not aware of it, their mind is permeated with mental processes taking place in silence, and these processes lead to impressions, intuitive judgements and various decisions. Behavioural finance deals with the manner with which emotions and structure of human mindset influence their choices when making investment decisions. Research suggests people express a different degree of emotion towards gains than towards losses. Individuals are more stressed by prospective losses than they are happy from equal gains. In their book Choices, Values, and Frames, Daniel Kahneman and Amos Tversky¹ found that satisfaction curves and dissatisfaction curves are not mirrors of each other. When an investment is behaving as we expect, we are pleased, but our satisfaction can be measured as a slow, gentle, upward curve. However, when an investment is not performing well, our dissatisfaction falls sharply and quickly. When things are great, we feel that nothing can stop us. And when things go bad, we look to take drastic action. Because emotions can be such a threat to an investor’s financial health, it is important to be aware of them. This awareness can then protect you from the negative consequences of impulsive and irrational reactions to them. Research shows that investor behaviour does a lot of damage to a portfolio. Good intentions aside, investors pile into stocks when the market reaches new highs. When it falls, they jump ship. The result is a repeating cycle of buying high and selling low. 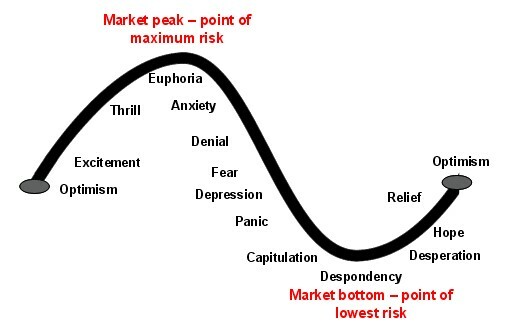 The chart below, developed many years ago by Russell Investments, shows pretty well how investor psychology appears to develop through a market cycle. When times are good, investors move from optimism to excitement and eventually euphoria as an investment’s price moves higher and higher. By the time the market tops out, investors are maximum bullish and fully invested, often with no one left to buy. This ultimately sets the scene for a bit of bad news to sooner or later push prices lower. As selling intensifies and prices fall further, investor emotion goes from anxiety to depression, and eventually capitulation and despondency. By the time the market bottoms out, investors are maximum bearish and out of the market. This sets the scene for the market to bottom, as it only requires a bit of good news to bring back buying, and then the cycle repeats. The stories spread by the media are often not helpful. Two days of market decline, and our favourite business news channels are calling for Armageddon, and this can quickly lead to irrational investment decisions. In the same way, spreading stories of possible bank insolvency can lead to a bank bankruptcy, because account holders withdraw their deposits. When situations seem overwhelming and panic is flying from all sides, Kahneman offers a straightforward solution in his bestselling book, Thinking, Fast and Slow² – slow down. Kahneman divides our brains into two parts – system one, the automatic and intuitive side; and system two, the thoughtful and rational side. In most of our lives, system one handles the mundane, repetitive tasks, while system two is reserved for those events that need analysis. Unfortunately, when we are under stress, system one cranks into full gear and generates instant and often drastic suggestions. It never even gives system two an opportunity for input, which pleases system two because it is lazy and tires easily—however, it can be engaged. 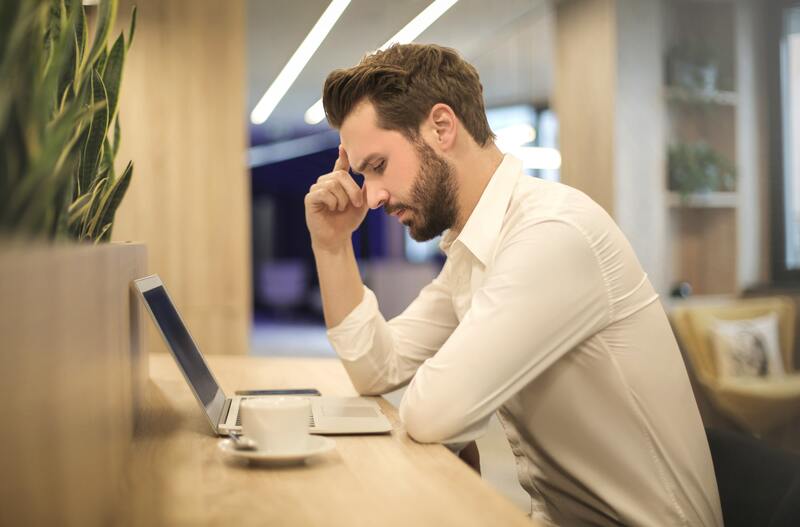 An investor who is faced with a stressful situation can more easily engage a proven theory base by simply slowing down, avoiding the first behaviour that springs to mind, and letting system two make a logical judgment. Emotions turn rational investors into irrational investors. It is important to remember that markets move and investments will always go in and out of favour. Selling out of fear as the market declines produces sub-optimal returns. At a minimum, investors should consider this fact before acting out of fear. In the bigger picture, though, the way to avoid letting fear or greed drive your decisions is to develop a plan and stick to it. If you understand why you own what you own, you are much less likely to panic when you hit turbulence. Don’t spend too much time watching TV news or checking your accounts. It only leads to bad behaviour. Focus on your needs and goals. Developed, diversified, long-term financial plans are placed in jeopardy when investors are confronted by extraordinary events, because we are guided by our emotions. This is where the role of the financial adviser is of utmost importance – your adviser will help you separate your emotions from reality and endeavour to steer you on the path of rational investing. Kahneman, D., Tversky, A. (2000). Choices, values, and frames. Cambridge University Press, Cambridge. Kahneman, D., (2012). Thinking, fast and slow. Penguin, London.